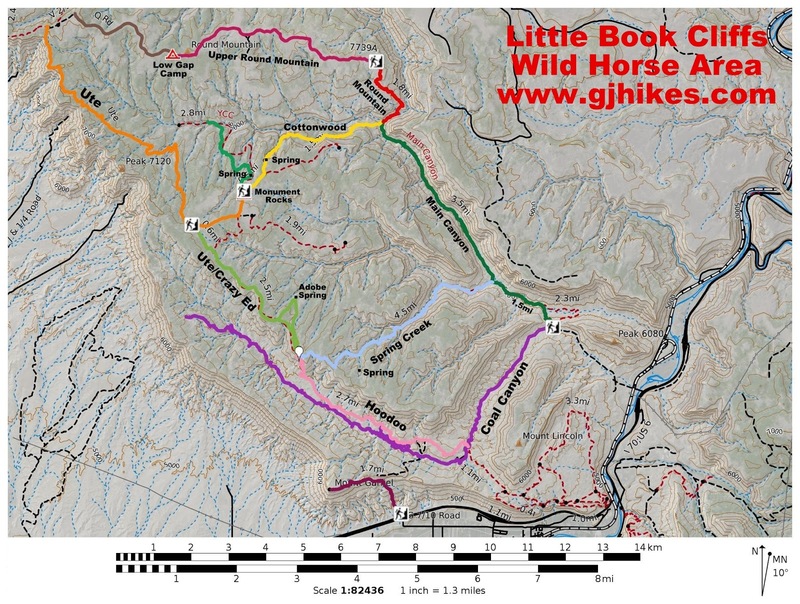 The Crazy Ed trail is located in the BLM's Little Book Cliffs Wild Horse & Burro Management and Wilderness Study Area near Grand Junction, Colorado. The trail begins off of the Ute trail near Monument Rocks where it travels east, passing Adobe Spring, and ending at a junction with the Spring Creek and Hoodoo trails. It is not uncommon to see a herd or two of the area's wild horses somewhere in the area. 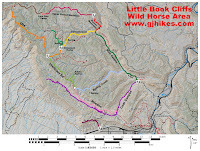 For this post we are beginning off of the Ute trail about 1.5 miles from Monument Rocks. To get to the trailhead follow the directions for the Cottonwood Canyon trail and stop at the sign in this photo just before getting there. The brown mylar trail marker will have a sticker on it that says 'Ute trail' which is how the trail is labeled on some maps. 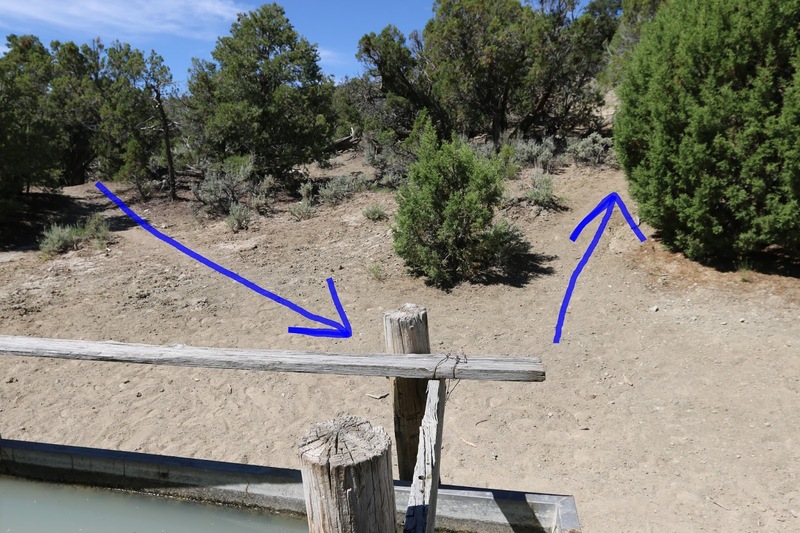 Older maps show the trail from here to the Spring Creek and Hoodoo junction as being the Ute trail and Crazy Ed was just a 1.5 mile segment of trail that ran from just this side of Monument Rocks over to this trail. Current maps on the BLM's website as well as the map in our Garmin GPS show the whole thing as being Crazy Ed. For almost the first 1.5 miles the trail is an easy hike along an old jeep road. This part of the trail is open to jeeps, ATV's and mountain bikes. After going only about a quarter mile we came upon a small herd of wild horses that included a colt. It is best not to approach the horses as the stud can sometimes get a little protective not to mention the motherly instincts of the colt's mare. Often times the stud will position itself between you and the herd. At the end of the jeep road the route crosses the boundary of the Wilderness Study Area beyond which only hiking and horseback riding is allowed. The trail transitions to a single track at this point. The dual identity of the trail surfaces with one marker that is labeled Crazy Ed and another as the Ute trail. At present the next 1.2 miles of the trail is unmarked. For the most part the trail is obvious but there are places where careful route finding skills are necessary. A GPS device with the GPX file preloaded in it would be very helpful. Just past the 2.5 mile point the trail comes to a fork that leads out to Adobe Spring. That route adds a little distance to the hike but it is better marked and might be a little easier to follow. On the trip out we went right at the Adobe Spring junction, thinking to take that route on the return trip. At first the trail is easy to follow as it wraps around the hillside but it soon comes to an open area where the wild horses have made trails going every which way. We ended up losing the trail but since we had a waypoint preset in our GPS for the Spring Creek/Hoodoo junction we were able to work our way towards it. Normally when we lose the trail we travel laterally in the direction we think it should be until we pick it up again. If we would have done that in this instance we would have found the trail again in less than 100 feet. If you are interested the waypoint for the junction is 39.15723, -108.42013. There is a wooden sign at the junction as well as brown mylar markers for the Spring Creek and Hoodoo trails. The wooden sign refers to the Bouse Trailhead that it says is 3.5 miles away but we have never figured out where that is supposed to be. The Coal Canyon trailhead is more like 7 miles away. On the return trip we took the Adobe Spring route. There are quite a few springs in the Wild Horse Area. They are fed by aquifers from the much higher Book Cliff Mountain Range that is further to the north. The water at Adobe Spring is a little milky looking compared to the other springs we have seen. That might be why it has the name Adobe. Going in this direction it is a little confusing figuring out where the trail heading west back to the main route is at so we marked it in this photo. We came in from the east on the left. After going a short distance in the direction of the arrow on the right the trail becomes a little more obvious but there are spots where route finding skills are needed. The western branch of the Adobe Spring trail does have a few Ute trail markers that were nice and new looking when we took the photos for this post. There were also ribbons of surveyor's tape tied to tree branches in a few places. There were bear tracks the full length of the trail that looked like they were made the previous night. One large set of tracks stretched along the full length of the trail while tracks from a sow and her cub showed up for part of it. We mused that they were probably heading for the orchards in Palisade. Whether they want to call it the Crazy Ed or the Ute trail doesn't really matter but at present some hikers might find it a little confusing. The map and one trail marker call it the Crazy Ed while at least 6 markers call it the Ute trail. Even though the trail is close to Grand Junction it can take about 3 hours to get to it by the time you drive around to DeBeque and then go 30 miles through Winter Flats and Indian Park. The drive is pretty but it does get slow in places where a high clearance vehicle is required. If you like seeing wild horses and not a lot of humans then you should enjoy Crazy Ed. If you would like to see it for yourself then all you have to do is 'Take a hike'.